Mix sesame with tempered gianduja. Spread the mixture in a 3mm frame thick. Let harden and make 20mm diameter circles. Mix marzipan with a bit of Amaretto making a soft mixture. Add the remaining Amaretto, honey and butter at room temperature. Combine the tempered chocolate and work until a soft cream is obtained. 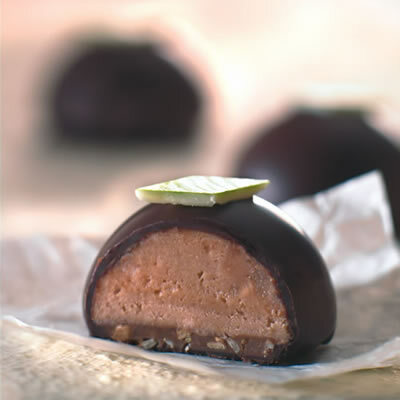 Make thin chocolate half spheres and, when they are hardened, put the creamy filling and close immediately with another half sphere. Let crystallize. 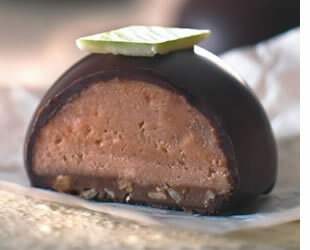 Or on the other hand pour the filling like a ball’s shape over gianduja bases, then let crystallize. Let rest the insides at room temperature before dipping in fondant chocolate. Garnish.